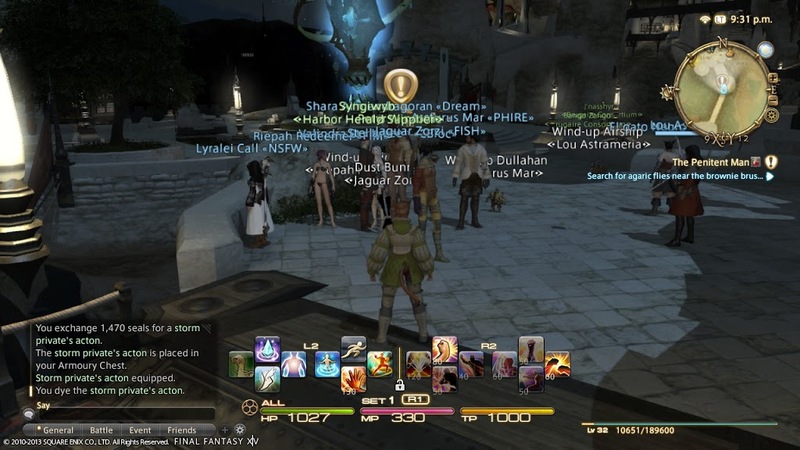 It’s high time I went back to my Final Fantasy XIV: A Realm Reborn coverage, wouldn’t you agree? Last I spoke of the game was on episode six of Chic Pixel Plus, and though I was loving the experience, I wasn’t sure if I’d go all in for the full three month subscription. Well, I’m happy to report that I did (my wallet is less happy), and I play it nearly every day! 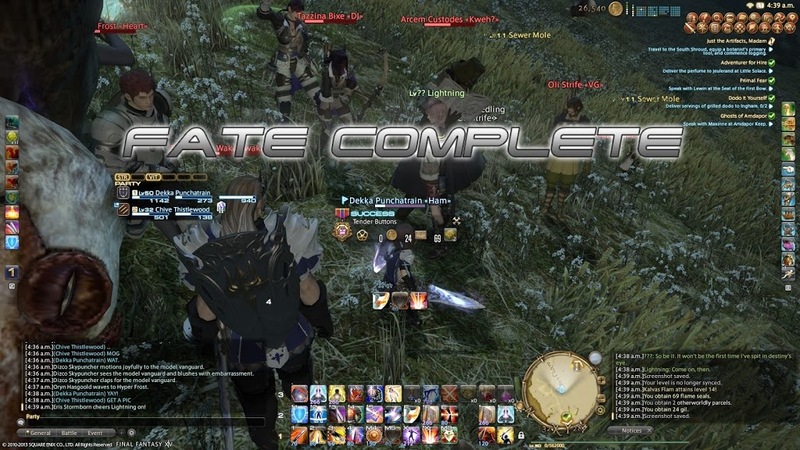 As a first-timer when it comes to MMOs, I find the allure of seasonal/special events very strong, regardless of how cheesy they might be. Luckily for me, FFXIV is already on its 3rd special event since its official launch, this time commemorating the impending Japanese release of Lightning Returns: Final Fantasy XIII. 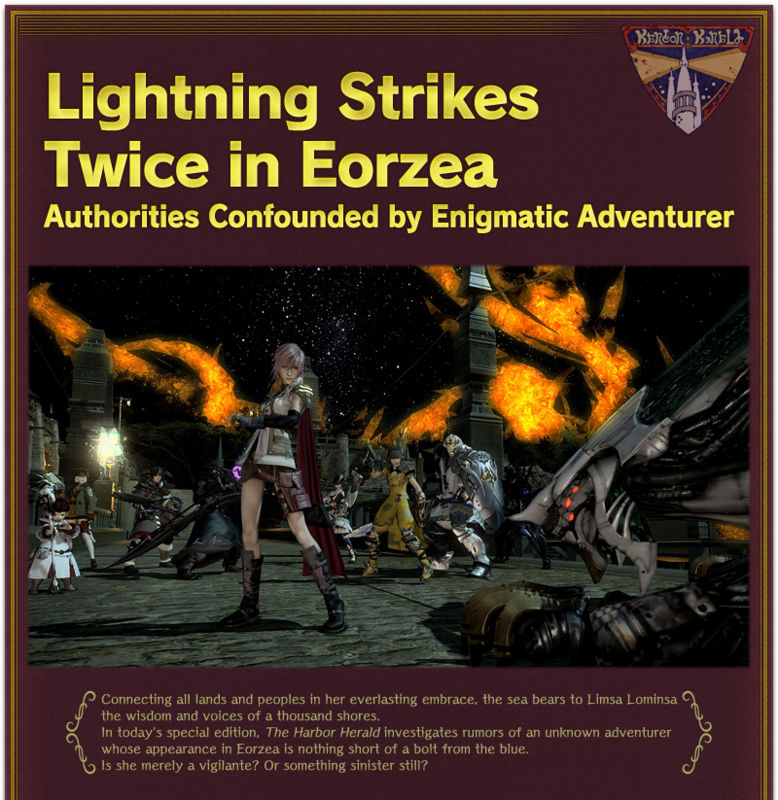 The special event, called Lightning Strikes (I see what you did there, Square Enix), finds Final Fantasy XIII‘s Lightning spirited away to the world of Eorzea for reasons unknown. 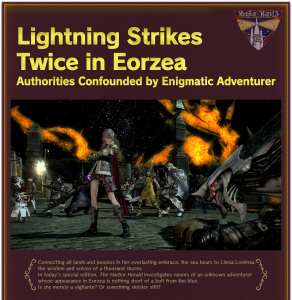 The first chapter, For the Winsome, released on Thursday, November 14th, and rewards those who complete it with a set of gloves modeled after either Lightning’s or Snow’s, depending on the gender of your character. That means Chive wound up with the Bohemian’s Gloves, even though Snow himself doesn’t actually appear anywhere. 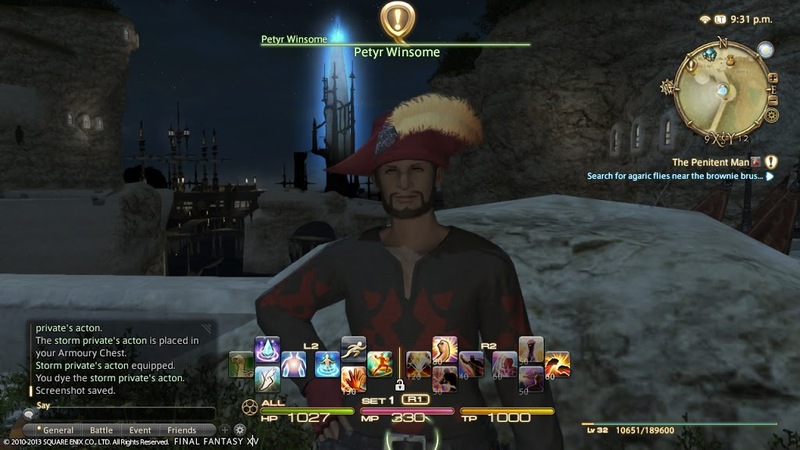 To initiate the quest, players must make their way to an NPC named Petyr Winsome, located at the Lower Decks of Limsa Limonsa (X:9, Y:12). 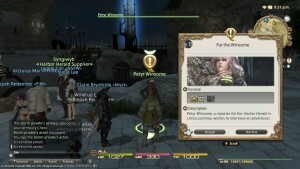 Luckily, for the first chapter, players only need to be level 12, but subsequent quests will have increasing level requirements, culminating in level 45 for chapter four. Apparently he’s a reporter looking to gather information about a mysterious traveller from another world (Lightning, of course). Your task, if you choose to accept it, is to… find and observe her, really. 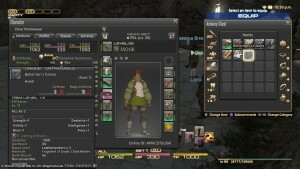 As an added touch, the “quest accepted” font is actually the font from Final Fantasy XIII! I didn’t get a screenshot of that, but we’ll see it again later on. 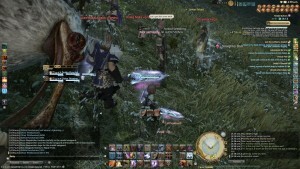 After accepting the quest, you need to go find Lightning in a FATE (Full Active Time Event). 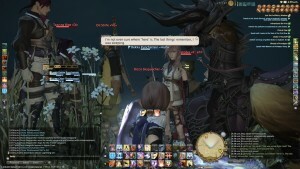 She appears in two: Sister Crustacean (Middle La Noscea, X:16, Y:12) and Tender Buttons (Western La Noscea, X:32, Y: 28). 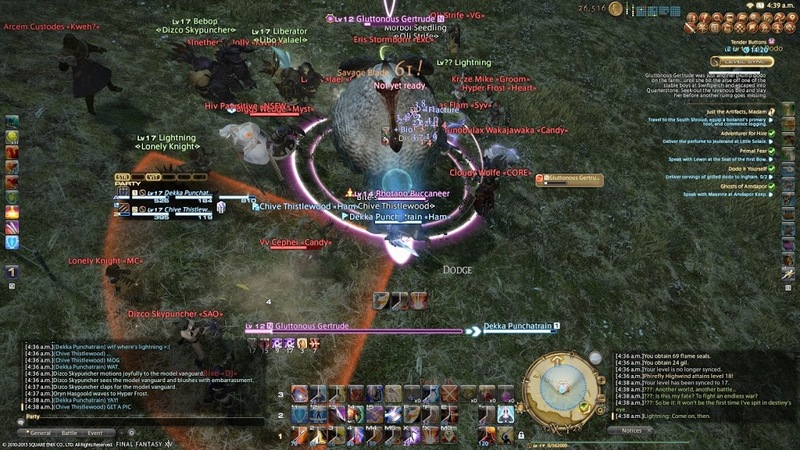 Both of these FATEs already appeared in the game before the Lightning Strikes event, and Lightning only shows up every other time the FATEs spawn, which averages out to be approximately once every 30 minutes. 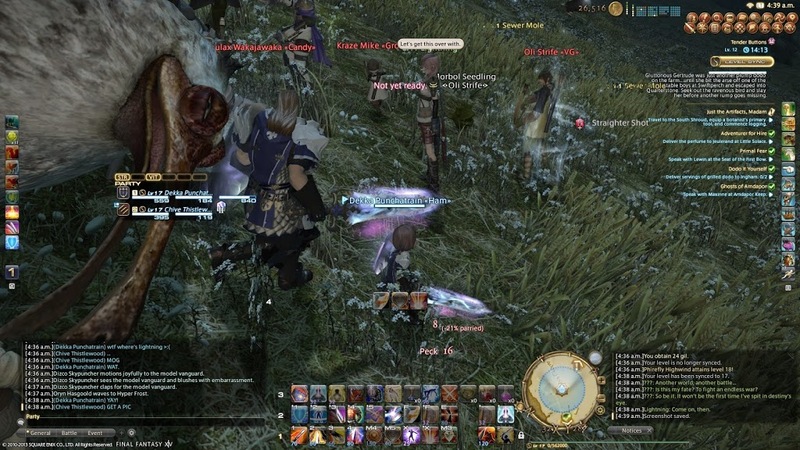 I ended up going for the Tender Buttons FATE because you get to fight a giant Dodo (Sister Crustacean is a giant crab battle, so whatever floats your boat). As you can see, there were a lot of folks eager to participate in the event! 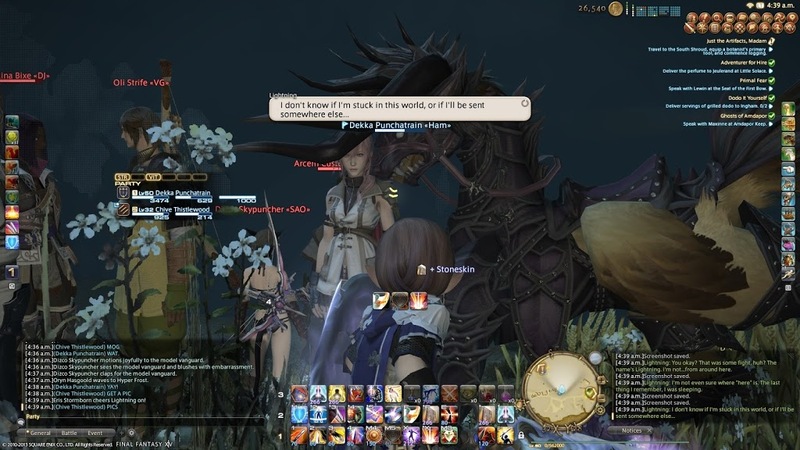 It’s clear when Lightning is present, as the music will change to the Final Fantasy XIII battle theme (very cool), and she’ll say a few lines of dialogue. 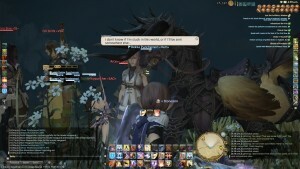 Many thanks to Mog for taking these screenshots, as I wasn’t able to actually see Lightning on the PS3 with so many other players running around. Completing the quest with a silver medal will net you one Other Worldly Parcel, while a gold medal will reward you with two. 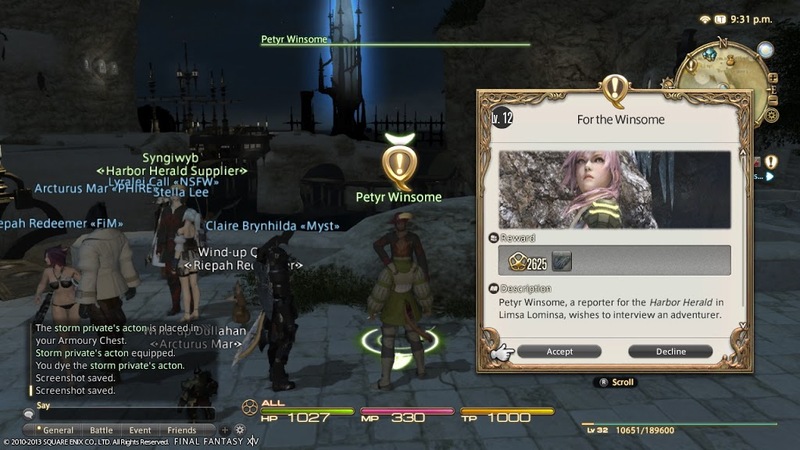 If you want to collect all the different event weapons, you’ll need to stick around and do the FATE a few times to collect more Other Worldly Parcels, as one will be given to Petyr Winsome to complete the quest and any extras can be used to purchase the weapons. To complete the quest and get all the weapons, you’ll need 9 Other Worldly Parcels total. 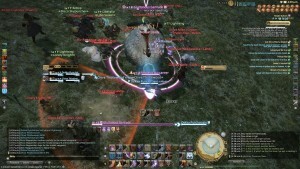 Lightning will stick around to exchange a few words after the FATE is completed. 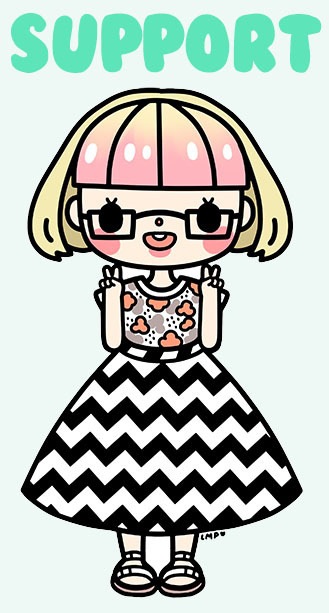 If you’re lucky, you’ll be able to see her – unfortunately for me, things were so crazy I never got to actually see her in my game! I’m sure it’s just unusually crowded since it’s the first couple days of the event. 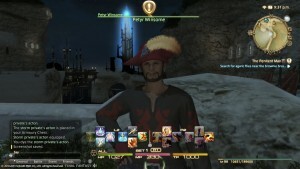 After heading back to Petyr in Limsa Limonsa and handing him an Other Worldly Parcel, you’ll be gifted with either the Guardian Corps Gauntlets or the Bohemian’s Gloves. 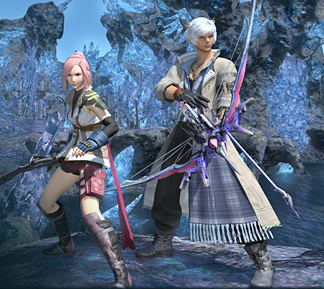 You’ve just completed the first step towards a full Lightning or Snow cosplay! 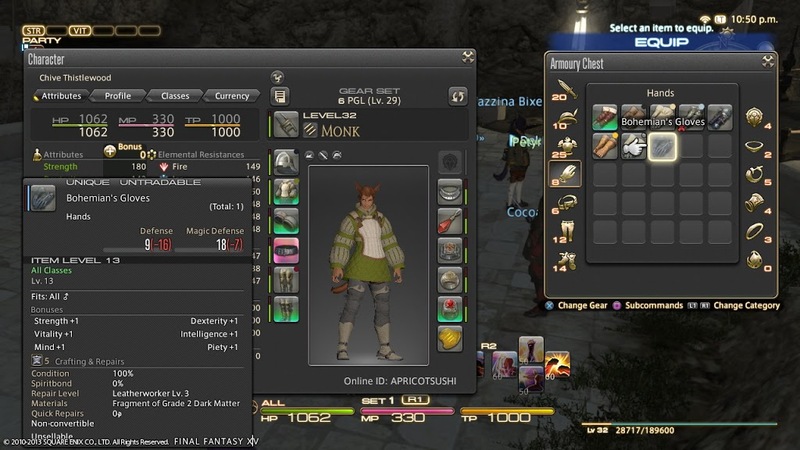 Unfortunately, if you’re a higher level, the gloves themselves are pretty useless since they’re only level 13. 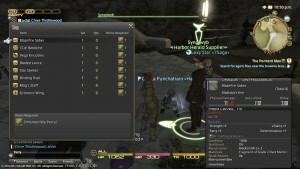 In fact, all of the subsequent items in the event are level 13, which is a bit of a shame. 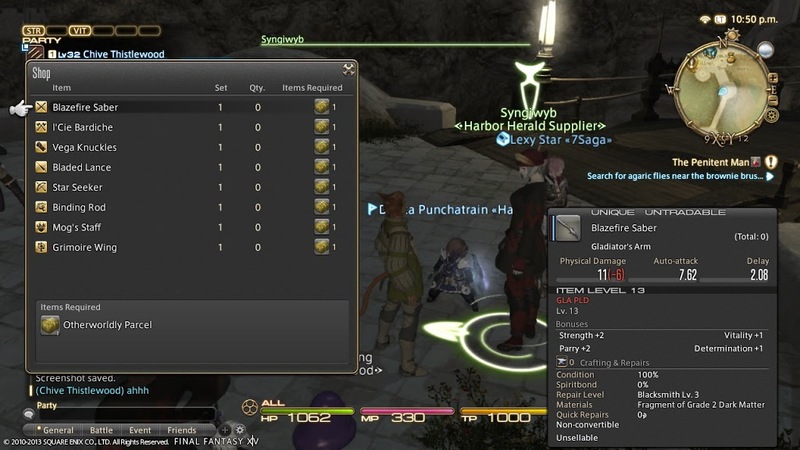 Now, if you have any extra Other Worldly Parcels, you can head over to… er… Syngiwyb to exchange them for whichever weapons you want (she’s standing right next to Petyr, you can’t miss her). You won’t be able to move these out of your inventory, so unless you’re a big collector you may not want to go for every single weapon. And there you have it! That’s the end of chapter one of Lightning Strikes. Chapter 2 will be available from Saturday, November 16th at 12:00 am PST in Uldah, and you’ll need to be level 26 or above to participate. 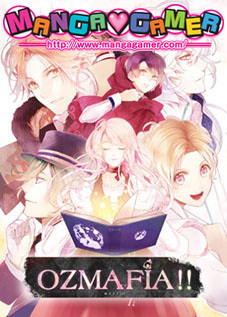 All of the chapters will be available until the event ends on December 9th, and the whole event will occur again in February alongside the English release of Lightning Returns: Final Fantasy XIII. You can find the full details on the official website.